Tiger Canoes are handmade in Hala’ula, Kohala (Big Island), by March "Tiger" Taylor; a master boatbuilder with over 25 years experience in building canoes. 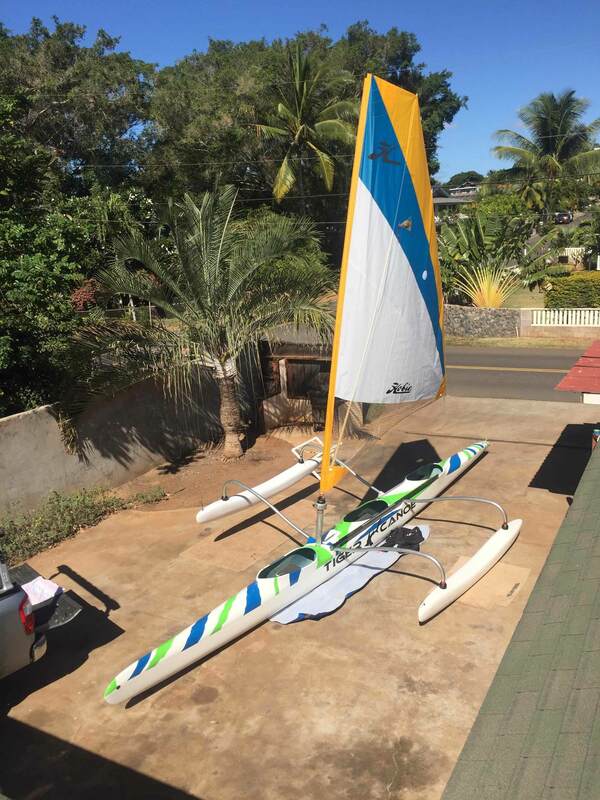 Model: Kauhola V-3; designed to be an open ocean canoe, light and easily maneuverable. It can be fitted for sailing or for physically challenged athletes due to the ability to rig ama on both sides. The hull is closed in with three cockpits.This all carbon model yields a hull that weighs approximately ~ 100 lbs with the addition of mast and center board housings after re-fitting for sailing, The hull is ~ 31’ long and 18.6” wide at seat 2. I transport it on my Jeep !! Paddle in the morning, then when trades come up - SAIL ! !